BSG Technologies QOL "Signal Completion Stage"
I have been reading information about a so-called cure-all device on several different audiophile websites for over six months that, when it is inserted in between your source and preamp or in between your preamp and power amps, it would work "magic." The reviewers also claimed that it would profoundly improve aspects of any recorded music. The list of improvements would include richer, more natural timbres, a bigger as well as more three dimensional soundstage, and add a sense of air and space around different players. The editor of one of the most highly regarded high end journals wrote a review on this "magic box" and stated, "... produces a sound that I think is closer to that of live music." The name of this device is the QOL "Signal Completion Device" which sells for $3,995.00 and is manufactured by BSG Technologies. So, you can see why I was very intrigued to see if these wonderful sonic changes would happen if I inserted the QOL Signal Completion Device in my system. • Read source component reviews from HomeTheaterReview.com. 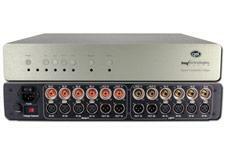 • Explore reviews in our Stereo Preamp Review section. • Learn more in our Amplifier Review section. The QOL Signal Completion Device is well built with a silver face plate weighing 25 pounds, having a width of 17 inches, depth of 13 inches and a height of just over three inches. The front panel has six flat buttons for selecting different inputs and a bypass option. 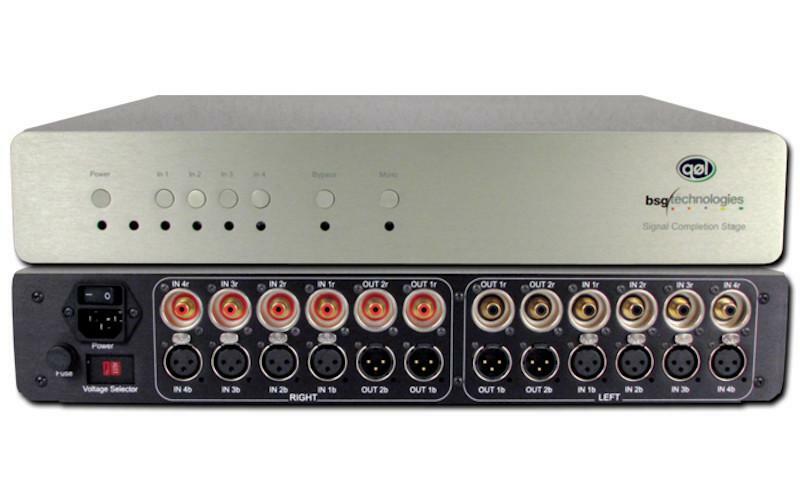 The rear panel has four sets of inputs and two sets of outputs, each both RCA and XLR, along with the AC mains inlet and AC power switch. It comes with a remote control so you can engage the active processing or bypass the circuit completely from your system. BSG Technologies stated that they have developed a patent pending technology that is able to recover previously hidden fundamental elements of sound that is buried in all audio signals. Also, they claim that it retrieves and restores this information, producing more realistic and natural experience of music. The QOL Signal Completion Device uses a playback process that is supposed to restore the natural phase relationships in audio signals. I will not pretend that I really understand their theoretical explanation for how this device works. However, I surely could use my ears to see if it brings the sonic changes that BSG Technologies claims it will produce in any system. The unit sent to me by BSG Technologies was a demo fully broken in. I inserted the QOL in both suggested positions in my system. In one position, I placed the QOL in between my source gear and the preamp. In another position, I placed the QOL in between my preamp and mono block power amps. From either position, I could not find any difference in sound quality, whether it be positive or negative, in my system. Over the course of a lengthy auditioning process, I used a wide variety of music. Some of the recordings were well recorded, while others were of average sound quality, and paired the QOL with two very different types of speakers. One speaker was a pair of MG-20s which are planer panels, along with a pair of Cellos which are a ported box enclosure design. To be quite frank, the results were very disappointing based on having high expectations of what I assumed would be a qualitative shift to higher level of performance in my system. Yes, on some recordings there would be slight changes in the soundstage regarding the position of some of the instruments. Was this a step towards a more natural spacing between players? My experience was that it just was different, not necessarily more accurate or natural. Regarding timbres or overall tonality, I did not find that the QOL Signal Completion Stage rendered an improved richness or more natural tonal qualities. On some recordings I found that the QOL Signal Completion Stage actually dried out the tonality of some instruments and took away some of the liquidity I normally have in my system. As an overall perspective on what the QOL Signal Completion Stage did in my system, I found that it did very little most of the time and occasionally, on certain recordings, got in the way of the natural ease and relaxation that is part of my system's overall sonic presentation. Read about the high points and low points of the QOL on Page 2. HTR Product Rating for BSG Technologies QOL "Signal Completion Stage"